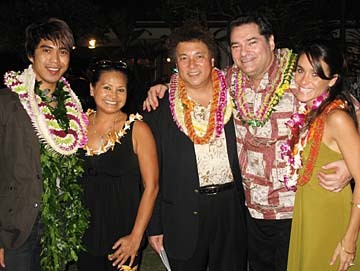 Johnny Kai, center, had a busy week presenting the Music Foundation of Hawaii 2008 Legacy Awards March 12 in the Monarch Room, and the 2008 Hawaii Music Awards Winners Banquet March 15 at the Willows. Among the winners Kai welcomed to the Willows was Jon Almosara, left, winner in the Gospel Inspirational Music category, who celebrated with Sonya Mendez, Kai, Larry Paxton and Candes Meijide Gentry. So many people came to the banquet that tables were set up on the grass outside, and by the middle of the program, the focus of the event moved outside. 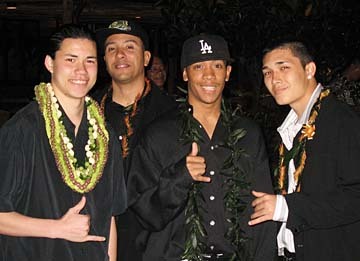 Aloha Joe, winner in the Compilation category, partied outside the banquet hall with Faith Ako. 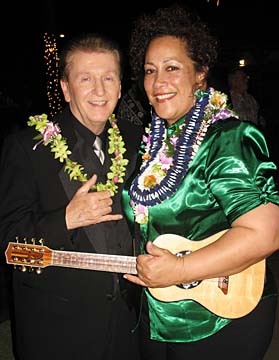 Ako knew when she flew in from California that her self-titled album had won Traditional Hawaiian Album, but did not discover until she went up to get her trophy that she had won Best New Artist as well. Peter Moon Jr., left, talked with Ty Tynan and hip-hop duo Jay Deuce and Da Ace. Deuce and Ace won the Hip Hop category, and were among several acts that performed during the show. Moon was representing his father, this year's recipient of the HMA Lifetime Achievement Award. 2008 Legacy Award winner Emma Veary, second from left, was escorted by "Uncle Freddy" Pregil and her daughters, Robyn and Kathy, to the Legacy event. Veary thrilled the crowd with her rendition of "Pua Pakalana," a song Robyn wrote for Emma's mother, the late Hannah "Nana" Veary. Veary followed that magic moment with a medley of songs by Irmgard Farden Aluli, "One Little Dream of You" and "E Maliu Mai." 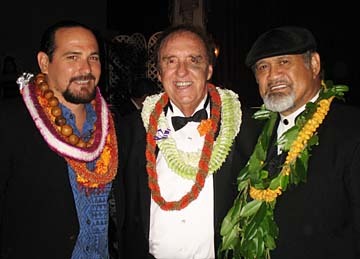 Kamana Beamer, left, congratulated Legacy Award winners Jim Nabors, recipient of the Actors Award, and Cyril Pahinui, recipient of the Loyal Garner Award (Pahinui also won the 2008 Hawaii Music Award for Slack Key). Beamer attended on behalf of his grandmother, Nona Beamer, winner of the Gov. Linda Lingle Fine Arts Award. 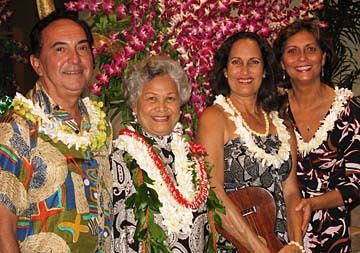 Other Music Foundation of Hawaii Legacy Award winners included Takeo Kobayashi, Eric Kamakahia'ia Chandler and Jeff Coelho.